Many people ask me what was it exactly that got me back into the hobby…Well this builder is the sole reason! 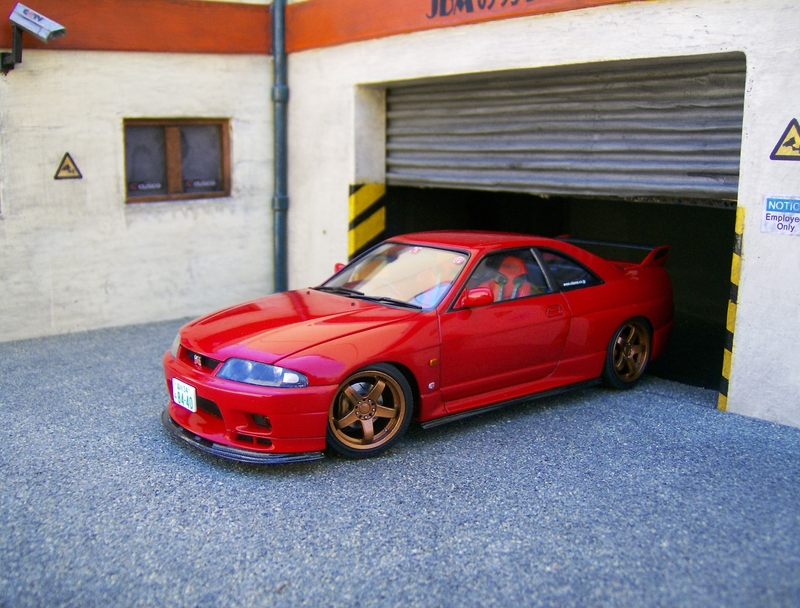 His name is Karl Briffa and his JDM garage diorama caught my eye one day on YouTube and the rest, as they say, is history! Now, onto his impeccable Nissan Skyline R33 GT-R. Starting at the rear and building up to the surprise at the front shows us Karl’s custom made rear bumper created using body filler, Tamiya putty and styrene. Keeping the rear spoiler the way Nissan intended, its centre section and end plates are donned in Scale Motorsport carbon fibre. The exhaust is also a custom piece with an aluminium tip, but more on that in a little bit! Working our way to the front of the car we can’t help but notice the carbon side skirts Karl created using styrene sheets in a mixture of thickness’s to enhance the already brutish lines of the R33. Very reminiscent of the Z-Tune side skirts, we’ll start to see how that car has influenced and enhanced this Skyline as we go. A nice touch and something you could almost overlook, are the carbon fibre B pillars too. The front bumper hasn’t escaped Karl’s Kreative touch with a scratch built lower section mated to a splitter from an R34 Z-Tune adapted to fit using styrene. You’d be mistaken for thinking it came from the factory like this! Wearing a genuine Nissan shade of AH3 Red Pearl Metallic and Kapci 2K clearcoat, the colour contrasts perfectly with the gold wheels fitted. These being the Nismo LMGT-4s wrapped in Bridgestone Potenza tyres from an R34. Enhanced with Tuner Model air valves for added realism. Now…..the best bit! Karl has gone above and beyond and made the kit Tamiya should have in the first place! A complete scratch built engine bay using a mixture of putty and styrene to house the RB26DETT engine from an R32 kit, but with a few upgrades……. Karl has ditched the traditional twin turbo set up in favour of a larger single turbo. Extra breathing power comes in the form of a scratchbuilt air filter. Keeping the engine at optimal temperature, a custom intercooler was fitted with bespoke piping too. The chassis is kept rigid thanks to the inclusion of the scratchbuilt strut brace. Taking a closer look at the chassis now, you can see that Karl has gone with a nice mix of colours that really add to the overall look. Including blue anti roll bars, a body coloured chassis and gold brakes. The small details really make all the difference, especially the exhaust, with its subtle weathering hinting towards the fact that this car is hardly a trailer queen! The Japanese tax disc in the front window is certainly proof of that! Aber photo etched hardware was used along with Tuner Model green harnesses for the ultimate street and track weapon look. The finishing touches being the Nismo steering wheel, also donated from the Z-Tune and a semi carbon fibre dash to really update the looks of the cabin. 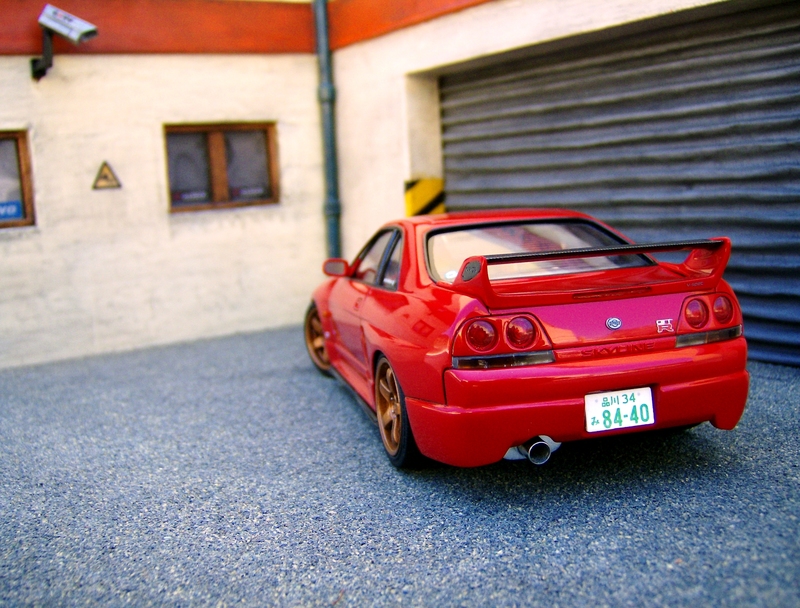 I must say this is and probably always will be my favourite R33 model I’ve ever seen built. The attention to detail in every aspect of this build astounds me and when its parked up at his garage diorama, it brings the model to life even more and lets be honest, you’d mistake this for the real thing when you saw it! A big thank you to Karl for letting me feature this wonderful build, I look forward to featuring more of your work in the future such as your yellow Evo 7! To see more of Karls work as it happens, Click Here to see his website and Click Here to view his YouTube channel! Would you like your build featured? Just head over to here!